After School Matters Program offers free after-school programs in the neighbourhoods of Grantham, Manchester and Rykert in St. Catharines as well as in Thorold. Contact Niagara processes service referrals and intake for mental health, children's developmental and other community service providers. The Dreams to Memories Foundation assists terminally ill parents with children under 15 (and living in the same home) with an opportunity to have a family last wish experience. Application form is available on their website. EatRight Ontario gives free health eating advice and fact sheets on digestive health. You can speak to a Registered Dietitian for nutrition advice. Eye See… Eye Learn® provides OHIP-covered eye exams and free eyeglasses for junior kindergarten students in participating regions. Click FIND A DOCTOR and search Niagara for all participating optometrists. The Family Mental Health Support Network offers free workshops that focus on helping caregivers understand mental illness, treatments and what mental health services are available in the Niagara region. Jumpstart is a community-based charitable program that helps kids ages 4 to 18 in financial need participate in organized sport and recreation such as hockey, soccer and swimming. Parents or guardians must apply on behalf of their child(ren). Healthy Smiles Ontario is a government-funded dental program that provides free preventive, routine, and emergency dental services for children and youth 17 years old and under from low-income households. Homework Help provides free online math tutoring, available for students in grades 7-10. Kidsport Niagara a regional chapter of KidSport Ontario, a national registered charity. They give grants that put kids into sports activities. Eligible families can apply by completing a grant application. Kids Help Phone for ages 20 & under. Free, 24/7. Anonymous & confidential. Non-judgmental. Mad Science of Niagara gets kids excited about science through hands-on inquiry based programming around the expectations of the Ontario curriculum. Grades K-8. 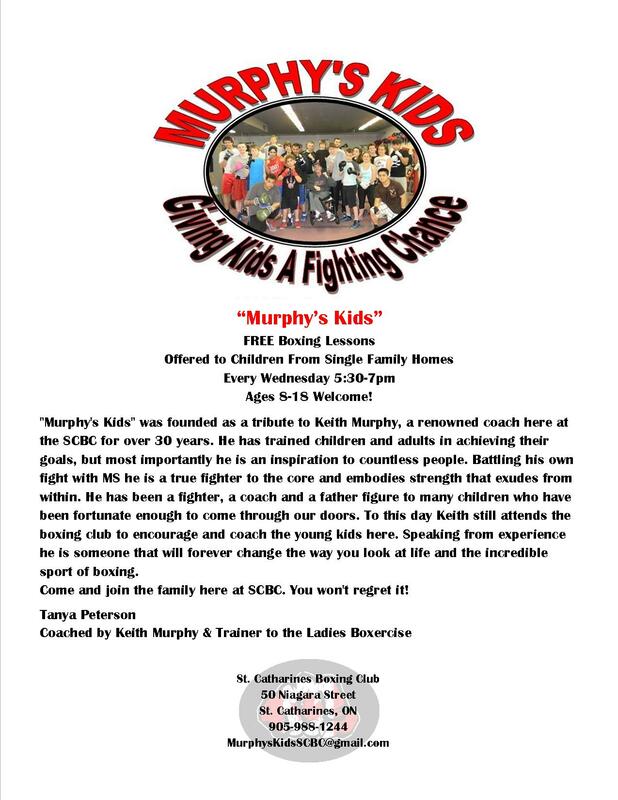 Murphy's Kids offers free boxing lessons to children ages 8-18 from single parent homes. MusiCounts helps to keep music alive in Canadian schools and communities by putting musical instruments into the hands of children who need them most. School personnel must apply on behalf of schools. Grants for after school programs are also available. Music Gives Movement. The Niagara Conservatory of Music helps provide music lessons to children from across the Niagara region who otherwise wouldn't be given the opportunity. They have teamed up with ProKids, an organization affiliated with the YMCA that funds extra-curricular activities for families that are in need. Through the partnership, the Conservatory assists in the payment of music lessons to those that express an interest and are eligible. Niagara's Mobile Dental Clinic travels through the Niagara region visiting schools and community locations. Niagara's ProKids Program supports the participation of eligible children and youth in the sport, recreational or cultural activity of their choice. Niagara Region Community Services includes children's services and homelessness services. Niagara Region Public Health for school health topics. Ontario Electricity Support Program (OESP) lowers electricity bills for lower-income households. The OESP provides a monthly credit to eligible customers based on household income and household size. The OESP credits are applied directly to eligible customers’ bills. The ReGift Depot helps students needing formal wear when Prom Project Niagara is not available. Teachers can contact the ReGift Depot and send students to one of the sites in St. Catharines or Vineland to shop for free for their special event. Renewed Computer Technology provides quality renewed computers for an affordable fee to help lower-income students and their families meet their educational and career goals. Smiles 4 Canada is a program run by the Canadian Foundation for the Advancement of Orthodontics in conjunction with the Canadian Association of Orthodontists. The program facilitates the orthodontic treatment of deserving young Canadians who would otherwise not be able to afford treatment. Applicants to the program must be under 14 years old. Patients who are accepted for treatment through the program will be treated by a local participating orthodontist. Patients’ families are only required to pay a small administrative fee, generally less than 10% of a complete course of treatment. Application criteria. St. Catharines Museum and Welland Canals Centre offers programs for schools and PD days. The Young Carers Initiative - Powerhouse Project offers a variety of FREE services and activities for caregiving children, youth, young adults and their families through social, recreational and educational programs intended to foster resilience, self esteem, and life skills. Programs and resources are offered.